There have already been two very good reports on this Clinic here and here, and I don’t want to regurgitate a review of the entirety of the event. However, I do think it is worth posting what I learned, in addition to a little about the event, and some pictures/video. This was a unique clinic, as I understand the clinics that Joey typically run are optimized for indoor racing around a 100m flat track that typically take place in roller rinks on coated wooden floors. Pretty much the entire group in attendance at this clinic skated outdoor over marathon distance. His original intent was to run the clinic at the Roseville Oval in Roseville, Minnesota. However, the weather didn’t cooperate, and we ended up using the back-up location at a nearby elementary school. While the venue ended up being indoor, the clinic focused entirely on technique, including the double push. I say something like this because I am not as low as I could be. If you look very closely at the picture from the front, you can see that my knees are collapsing in a little bit, notably on the right side. I shot these pictures after a heavy lift/plyo work out, so I was a bit rickety. Everything in skating basically starts from here. 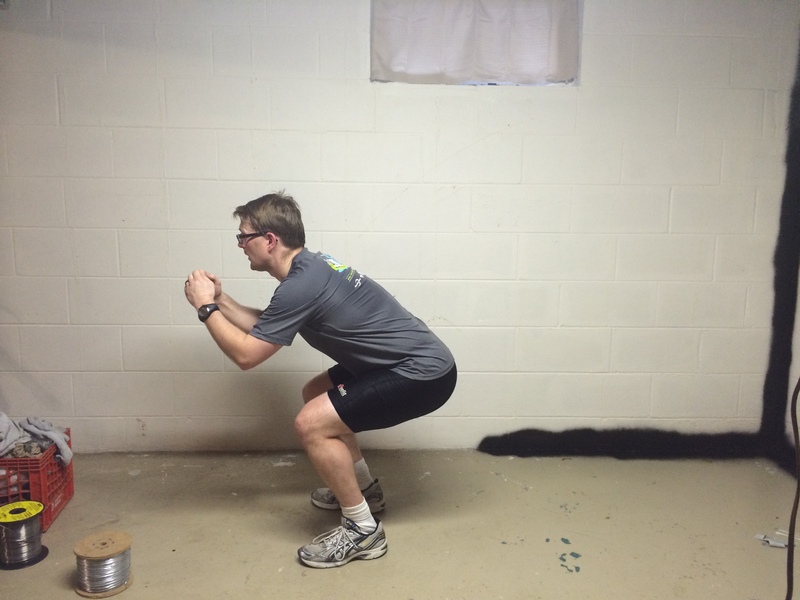 The only significant variation in body position is how deep you sit in the skater squat. As for the actual weight transfer, there were a couple of terms that kept coming up that are good points to focus on. This image was created from some video of my dry-land skating. You can see the the nose-knees-toes alignment here, but another important technique issue comes to light when reviewing the video. The hips and shoulders should remain steady and on the same line. I discussed this in my post about slide-board earlier this year. 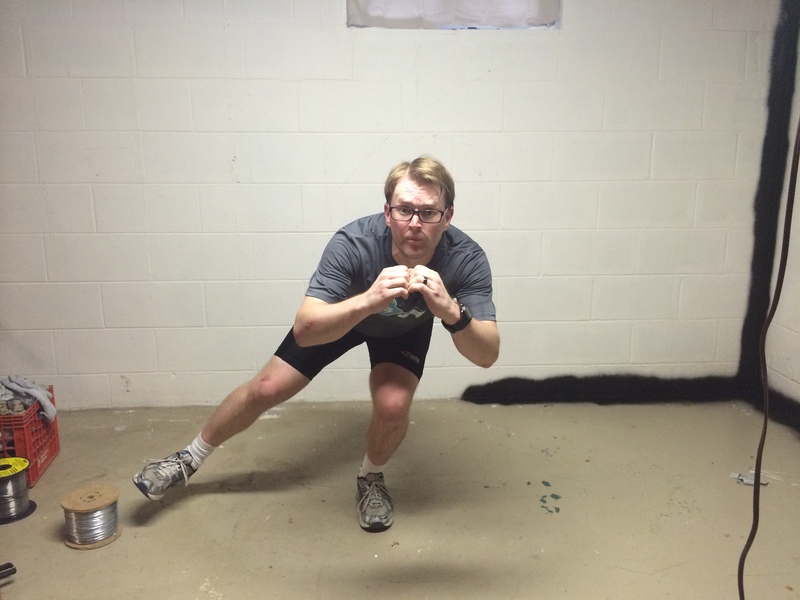 This is accomplished by engaging the core and focusing on lateral movement through the hips. You can also see here how leading with the hip works, as my hip on each side moves past the center-line over the foot. It isn’t perfect, though, as there is still some weakness in my right knee and a slight hop on raising my foot off the ground that causes my hip to shift up slightly on each side. Weight transfer is what allows you to put power in the push without expending extra energy. It is pretty much the Holy Grail of skating. So much so that you could skate only with weight transfer on classic push and add the double push to average 18 miles per hour. Well, at least he can. These drills provided me with very concrete examples of where my technique is failing. You can see this stuff in books and on the internet, but it never really sinks in until someone coaches you and/or you see it demonstrated first hand. The key to fast skating over marathon distances is efficiency. Something I have known and been working on, but these drills are the tools that will hopefully make me more efficient, and, as a result, faster. The afternoon started with more dry land and then back to skates. The dry land session was a rehash of what we did in the morning and was very helpful in solidifying the drills to memory. The afternoon on-skate session dealt with double push. He showed us a lot of drills originally designed by Eddy Matzger. It was a great session, and I realized, in the room full of local skating luminaries, that we all have things we need to work on. Following Joey’s philosophy, you have to work hard at the things you are bad at doing in order to get better. There are a couple of videos floating around YouTube of the event and there are several posted in InlineSkateMPLS that are worth checking out. After the afternoon on-skates session, Joey did some question and answer and then demonstrated some drills and technique on the slide board. The most shocking thing I learned during the Q&A was that Joey doesn’t lift weights. He has legs like tree trunks, but doesn’t lift. I was, and still am, shocked. The secret to his strength is isometric and plyometric exercise. 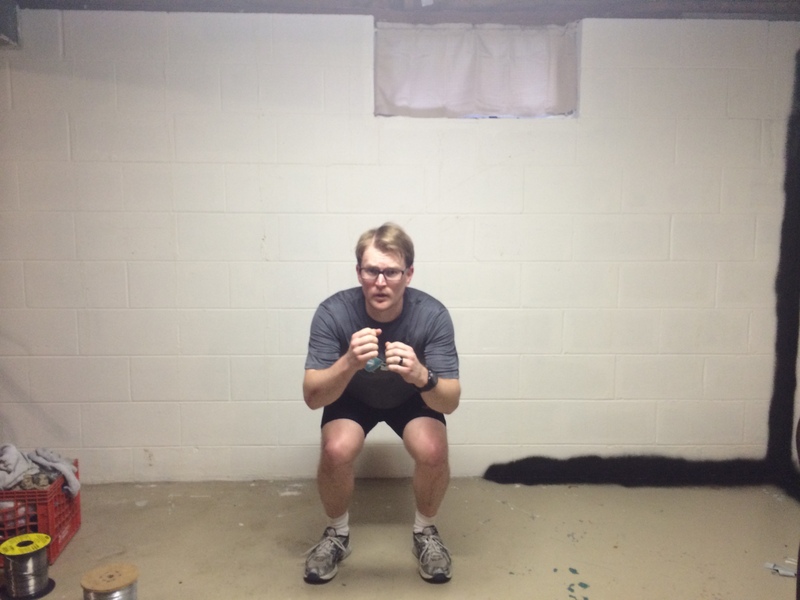 He does wall-sits to failure, which, for him, is 5 to 10 minutes. 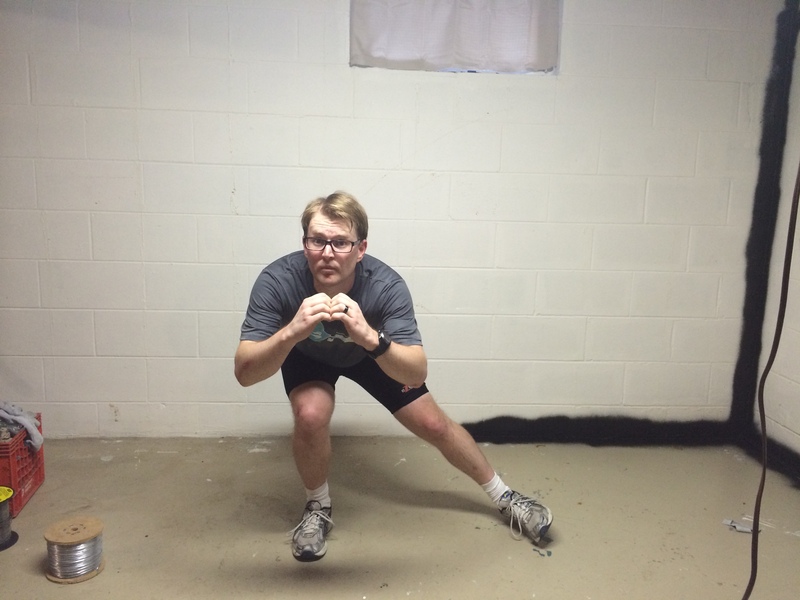 He also demonstrated some very basic plyos, many of which I am doing, but some that I am working into my workouts. The biggest new change, though, will be wall sits to failure. I am not going to replace lifting weights with plyos and isometric work outs because I am too far behind to work up to that level of strength, and I don’t see any negative effects from weight lifting on my skating. This also was another interesting lesson, just because it doesn’t work for Joey doesn’t mean it won’t work for me. Overall, this was a great experience. I would highly recomend that anyone who has an interest in becoming a better skater attend this kind of clinic, taught by Joey or any other world class skater. I was leading an echelon drill when one of the guys from the back of the pack sprinted and the rest of the group broke up and went after him. I sprinted to stay with the group that passed me, but my technique got sloppy. My left recovery skate swung in for set-down too quickly and caught the back of my right skate, resulting in the dreaded click that sent me tumbling. This happens in skating. I have learned to go with momentum and fall in a way that doesn’t cause direct impact on joints. I got up and rolled away with some road rash, but no broken bones. After resting for a bit, I skated another five miles, finishing out the skate at around 19.4 miles in just short of 80 minutes. Good work out, the fall not withstanding. Skating with Team Rainbo always reminds me how important pack skating is to the sport. If you like to skate long distance, regardless of whether you use speed skates, fitness skates, or rec skates, you can never get the same feeling of skating in a pace line. The dynamics of the pack are ever changing, and it forces you to adapt your technique to work with the group. It is also far more efficient. In the pack, we could easily pace between 17 and 20 miles per hour. I am glad I got to skate with Team Rainbo again. I am looking forward to suiting up in the new uniform for the Chicagoland Marathon and Roll for the Roses. The outdoor inline season is pretty much finished in this part of the country. There are still some races where it is warmer late in the year, like Silver Strand and the Tinsel Tri in California. However, the group that I skate with has all but disbanded at this point in the year. While other skaters in the area have moved to cycling or hockey, I am trying to skate as much as I can before the weather prevents skating, and it is time to start skating ice or move indoors. The Metrodome is due to be closed for demolition and reconstruction at the end of the year. As a result, I am planning on making a cross-training transition for the off season. Before moving inside or onto the ice, I took one last opportunity to run a tempo skate around the 8 mile loop I use for that kind of time trial. The goal was to set a baseline for training next year so that I can shoot for this target toward the beginning of the year. The goal was to repeat something that I only managed once this year, a 16 mile per hour speed average over 8 miles through the Cascade Lake trail. I went out at the beginning of the month, October 2, in the evening after work. I shot video, which follows. And I am going to run a side by side comparison of this run from the beginning of the year and the end of the year to get an idea of the differences in pace. This was a good skate, but it was a hard skate. I hope I can get back to this point early next year to build on this progress. Now that we are edging into the off season training is changing. I had good results this year thanks to a lot of weight lifting. I am putting weight lifting back into the schedule, but it won’t be a focus for weekly training this year like it was last year. My goal is to lift once, though preferrably twice, per week, get at least one plyometic and slide board session in, and spend some time working on base cardio fitness on the bike, ice, or in the Roller-Dome. So far, I have only managed to get back to weights, as I am still skating outside the weather permits. Future off-season posts will detail the transition to long track ice skating for cross training, more on power lifting, plyometrics, gear reviews of the Bont Z and Bont long track Jet boot, in addition to a tutorial on building a slide board. It looks like it will be a busy off season.